Homemade Chicken Stock - Bake.Eat.Repeat. 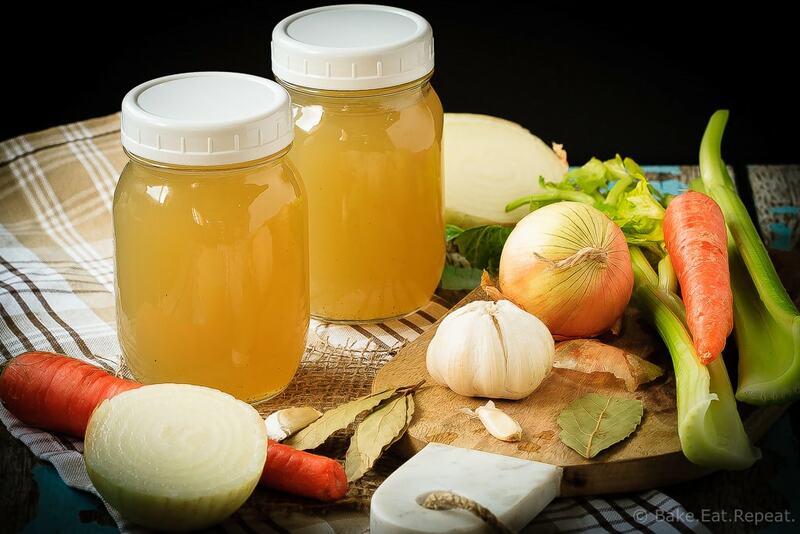 Homemade chicken stock is so easy to make, you’ll wonder why you’ve ever bought it. Plus, it’s so much tastier, and freezes well to always have on hand! Do you make your own chicken stock? Or have you never tried because it seems too daunting? The second one was me up until a couple of years ago. It seemed like way too much effort, and frankly, was just something I hadn’t really thought of trying. Much easier just to have some sitting in the pantry ready to use, right? Well, I won’t say that that option isn’t easier – of course it is. And I still always have some sitting in my pantry. Probably always will. That kind of chicken stock is not nearly as good though. It just isn’t, and if I’m craving some homemade chicken noodle soup, that’s not the option I want available to me. This homemade chicken stock is what I want to use, because that makes the best soup. And it’s not as difficult or daunting to make as I always thought it must be. In fact, it’s one of the easiest things to make. So easy that I’ve now taken to freezing the chicken (or turkey) bones every time I make one (or pick one up at the deli) so that I can make stock from them when I have a few minutes. Because that’s literally all it takes, about 5 minutes of prep time, and then another 5-10 minutes to store it. 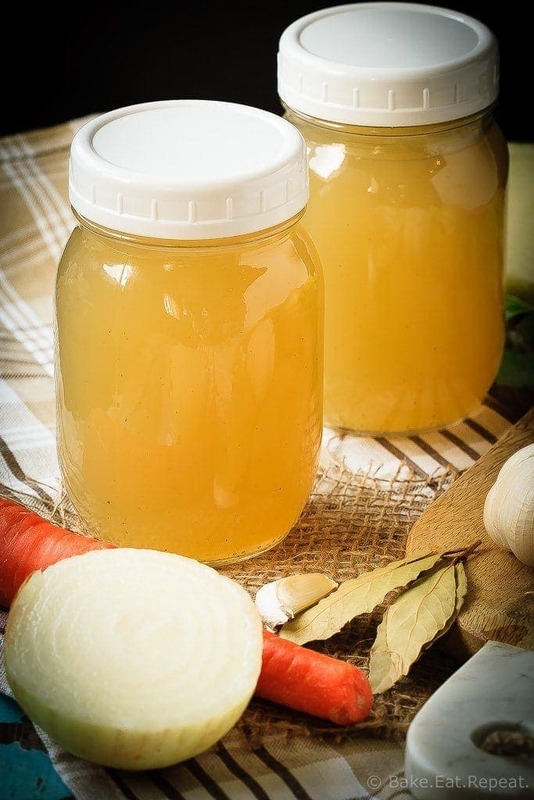 You can’t really beat that – amazing homemade chicken stock with 5-10 minutes of work. That’s it. I actually feel a little bit bad about all the chicken bones I’ve just thrown away over the years. I could have been making chicken stock with them! Why didn’t anyone tell me how easy it is? Okay, better question, why didn’t I listen?! So don’t be like me and decide homemade chicken stock is too difficult and not worth it. It’s so, so easy, and totally worth the 5 minutes it takes to throw it on the stove! 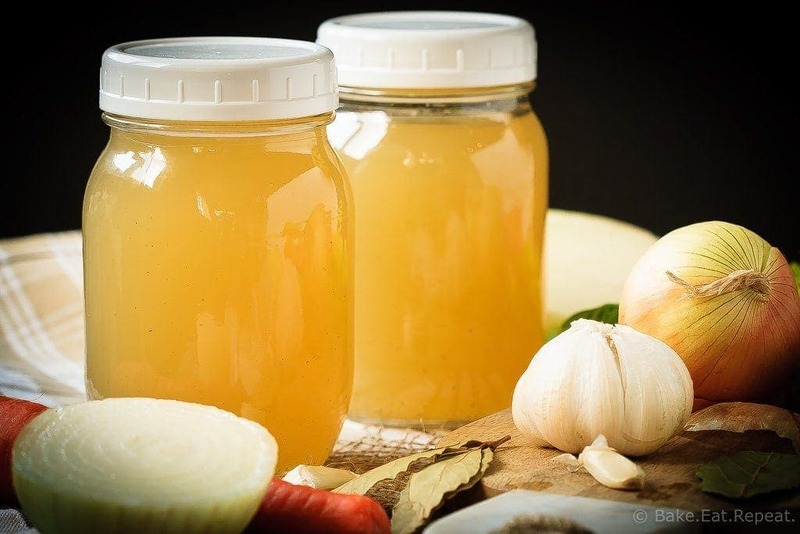 Homemade chicken stock is so easy to make, you'll wonder why you've ever bought it. Plus, it's so much tastier, and freezes well to always have on hand! Combine all the ingredients in a large stockpot (6-8 liter/quart) and bring to a boil over high heat. Reduce to a low simmer, skim any foam that has collected, and cover the pot with a lid. Let the stock simmer for 2 1/2 hours. Let it cool and strain the stock. You can use it right away, or store it in the fridge in a sealed container for 3-4 days, or freeze for 4-6 months. To remove the fat from the stock, store it in the fridge overnight, and then it’s easy to skim the solidified fat off the top before using it. This stock can also be made in a (6 quart or larger) slow cooker, the cook time is then 10 hours on low, or 5 hours on high. This works just as well with turkey bones, I use the bones from either two chickens, or one turkey in this recipe. Source: Slightly adapted from Smitten Kitchen .